The Twin Ports Choral Project. 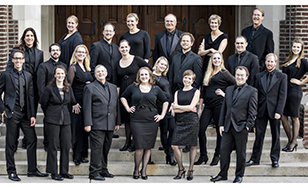 St. Scholastica's Cambiata concert series presents a performance by the Twin Ports' premiere choral group, showcasing the power of music to express emotions about even the most difficult events in history. Twin Ports Choral Project performs "Spirit, Moving Over Chaos" at 7:30 p.m. Friday, Feb. 26 in the Mitchell Auditorium at St. Scholastica. Tickets are $10 for general admission and $5 for local students and St. Scholastica faculty/staff. Twin Ports Choral Project director Bret Amundson, who is a St. Scholastica music faculty member, said the show will feature music from a variety of genres, including pieces written about specific tragedies and concerns, from school shootings to climate change. Communities from all corners of the world have turned to music as a means of working through hardship, hope, and healing. This performance will explore music composed in remembrance of people and places torn apart by poverty, disaster, and war. "We're singing songs of chaos, but also bringing it back to spirit," he said. "Cambiata" is Italian for "changed." The Cambiata concert series celebrates changing styles and the enduring value of music. The 2015-16 season concludes with "Haydn, The Prince and Baryton," at 7:30 p.m. Saturday, March 12.